The hint is the horseshoes. Bulle Rock Golf Club is so magnificent in scope, pleasing to the eye, and engaging in the actual playing, it’s quite easy to overlook the understated but elegant tee markers—blue, white, red, etc., delineating the teeing grounds. But the fact is, the markers are actual equine footwear, that proverbial good luck charm. And their importance goes beyond the fact that it’s fortunate golfers indeed enjoying this former horse farm--turned destination golf course on a sweeping, thousand-acre property. The club’s distinctive name stems from the fact that Cassandra Sappington and several other members of her family were buried in a small cemetery on the property generations ago. Cassandra’s grandfather James Samuel Patton is believed to be the first man to transport a thoroughbred horse to North America, back in 1730. That horse was Bulle Rock. And to honor her grandfather’s memory and keep the tradition alive, this was also the name Cassandra chose for her own horse many years later, as part of her wedding dowry. 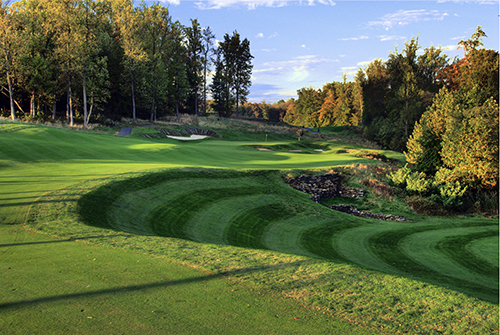 Bulle Rock Golf Club is the brainchild of a forward-thinking construction magnate named Ed Able. In short, Able made his fortune and then made a commitment to golf in middle age. His network of contacts afforded him access to many of the nation’s most highly regarded private clubs, including Seminole and Pine Valley. But eventually he tired of waiting for invitations to these bastions of the game, and he decided to build an upscale, public-access course of his own. He found appealing acreage in the Maryland foothills not far from the Chesapeake Bay, and made it accessible to anyone who might want to venture forth. “What’s impressive to me is this area’s history, the fact that they can track the title of this land all the way back to King George,” states the course architect. “The history was as interesting as anything to me, so I felt like I had to build something extra special to go with it.” He did. Everything about Bulle Rock is on a grand scale—the head-tilting elevation changes, width of fairways, height of trees, size of greens. Hole highlights are many, but the 550-yard par-5 second, with its rock-strewn stream menacing either a daring approach shot or a cautious lay-up, is an early indicator that the course is both bold and beautiful. It’s a terrific blend of talent and terrain, Dye’s artistry showcased on a phenomenal canvas. The course snakes up, over, around, and through a fescue-laden forest. The look, direction and elevation of holes constantly vary. The uphill slog on the dogleg par-4 5th, a brute at 450 yards, is followed by a dizzying drop on the sixth, another par-4 where a player is tempted to yell “Geronimo” upon making solid contact from the tee. The 11th is a downhill par-5--and needs to be--at 665 yards from the tips. The 14th is downhill also, but swinging from the heels isn’t recommended, as the tee ball needs to be fitted precisely on the fairway of this 330-yard par-4. Eventually the money ran out for the additional eighteen holes planned for the property, though the Dyes had most of those roughed out. But financing the addition was slower than expected, and the tragedy of September 11, 2001, ground it to a complete halt. 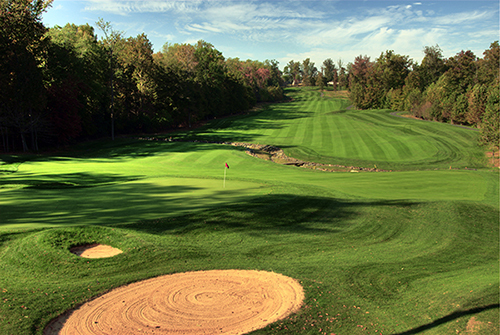 The end result of the project’s interruption is a championship course and a practice facility that is remarkably capacious in width and breadth. An ownership change means that eventually there will be a significant housing presence, with some 2,000 dwellings, including stand-alone houses, townhouses, and condominiums. But the majority of these will be located in clusters away from the golf course proper, with only a small percentage bordering the playing corridors themselves. Original owner and course visionary Ed Able once remarked, “plenty of people say they want to build a world-class golf course, but for whatever reason, it doesn’t happen. 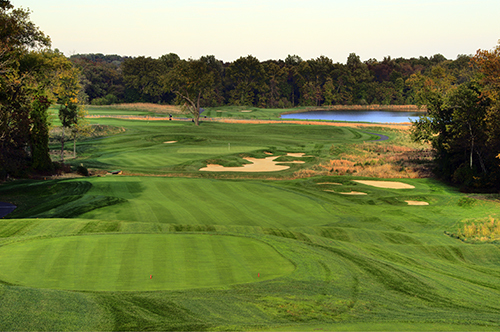 I’m very glad to note we not only said it, but did it, thanks to the hard work and expertise of Pete Dye.” Though Able is no longer involved, there can be no disputing that Bulle Rock Golf Club, just like the prize-winning stakes horse for which it was named, remains a true Thoroughbred.